1852 Thinnfeldia speciosa ETTINGSHAUSEN, p. 4, Pl. 1, Fig. 8. 1855 Pachypteris speciosa ANDRAE, p. 44. 1997 Thinnfeldia speciosa POPA, p. 82-84, Pl. 1, Figs. 1-2, Pl. 2, Figs. 1-4, Text-figs. 1-4, 6. 2000 Pachypteris speciosa POPA, p. 128-132, Text-fig. IV. 37, 41, 43-44, 46-53, Pl. 52, Figs. 1, 3-6, Pls. 53-55, Pl. 109, Figs. 1-3. 2003 Komlopteris speciosa CLEAL and REES, p. 751-752, Pl. 13, Fig. 3, Pl. 15, Fig. 1. Pinnate leaf, with elongated, opposed to sub-opposed pinnules. Pinnules with entire margins, slightly acute apex, alethopterid venation, with a clear midrib and secondary veins simple or rarely divided dichotomously, at angles of about 30° with the midrib. Leaves hypostomatic, with thick cuticles, with stomata confined to areas between the secondary veins. 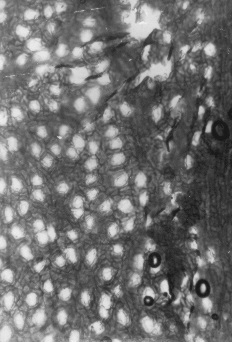 The stomatal apparatus has thin guard cells, 4-6 subsidiary cells, trapezoidal or elongated, organized in bowl-shaped collars. Pachypteris speciosa is a very interesting Corystospermal species for its anatomy, taxonomy and ecology. It was defined as a Thinnfeldia species by Ettingshausen (1852) from Steierdorf-Anina, the type locality of this denomination. Popa (1997), tried to keep the genus Thinnfeldia separated from Pachypteris and Komlopteris, at least for the species T. speciosa, on vegetative material collected from the same locality. However, this taxonomical position is impossible, as the type species of genus Thinnfeldia ETTINGSHAUSEN 1852, T. rhomboidalis, is a Pachypteris (BRONGNIART) DOLUDENKO 1971 species, so Thinnfeldia is a junior synonym of Pachypteris, as Doludenko (1971, 1974) demonstrated. P. speciosa has a special place within the genus Pachypteris, as Popa (2000) emphasized, with affinities for both Pachypteris and Komlopteris. 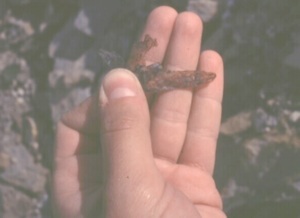 Cleal and Rees (2003), discussing about interesting material found in UK, considered this species as a Komlopteris species, based on morphological considerations. Popa (2000) described in detail the species, with its related vegetative and reproductive structures, keeping it assigned to Pachypteris. Anina, mainly within the Ponor SSSI, where it is exceptionally preserved and abundant. This species is Hettangian in age, belonging to the Thaumatopteris brauniana assemblage zone in the South Carpathians. Pachypteris speciosa is a marsh dweller, sometimes occurring on marsh edges. It is a coal generator, competing sometimes for the wet habitats with Cheirolepidiaceous conifers with foliage such as Pagiophyllum sp. or Incertae sedis conifers such as Podozamites paucinervis. This competition (Popa, 1997) was reflected in the coal genesis of a local Hettangian coal seam in Ponor SSSI. The material is exceptionally preserved in Anina, mainly in the Ponor SSSI, where all organs of this plant were collected. Andrae, C., 1855. Beitrage zur kenntniss der fossilen Flora Siebenburgens und des Banates. Abhandlungen der K. K. geologischen Reichsanstalt, III(4): 1-48. Cleal, C.J. and Rees, P.M., 2003. The Middle Jurassic flora from Stonesfield, Oxfordshire, UK. Palaeontology, 46(4): 739-801. Doludenko, M.P., 1971. Thinnfeldia - mladsii sinonim Pachypteris. Paleont. Journ., 2: 99-104. Doludenko, M.P., 1974. On the relation of the genera Pachyperis, Thinnfeldia and Cycadopteris, Symposium on Morphological and Stratigraphical Paleobotany, Lucknow, pp. 8-16. Ettingshausen, C., 1852. Begrundung einiger neuen oder nicht genau bekannten Arten der Lias- und Oolithflora. Abhandlungen der K. K. geologischen Reichsanstalt, 1(3 (3)): 1-10. Popa, M.E., 1997. Corystospermal pteridosperms in the Liassic continental deposits of Romania. Acta Palaeontologica Romaniae(1): 81-87. Popa, M.E., 2000. Early Jurassic land flora of the Getic Nappe, University of Bucharest, Bucharest, PhD thesis, 258 pp. Pachypteris speciosa, neotype, Popa collection, Ponor SSSI, Anina. Pachypteris speciosa, single pinnule, Popa collection, Ponor SSSI, Anina. Pachyperis speciosa, lower cuticle, Popa collection, Ponor SSSI, Anina. Pachypteris speciosa, abundant leaf cuticles in Ponor SSSI, Anina.